Millennials, millennials!! Those born between the years 1980 and 2000 – everyone’s talking about them… what they’re like, how they’re “different” from generations before them, how they’re changing workplace dynamics, etc. And for good reason because, as the Department of Labor reports, there are over 30 million millennial employees in the U.S. (as of April 2015), making them the largest demographic in America’s workforce – so employers, of course, want to know all about them. Now, if you think about it, in generations past, employers weren’t overly concerned about generational change in the workforce because they pretty much got to dictate who did what and how… but this time around, something’s different and employers are sitting up and taking note. That’s because this millennial generation is way more empowered and influential – from their buying power to their handle on the limitless potential of social media – millennials are notoriously good at addressing issues and being a voice for causes they espouse… like no generation before them! Millennial employees actively give and volunteer, in and out of the workplace, says The Millennial Impact Project (MIP) which studies millennials’ involvement with social causes and “doing good”, and helps organizations understand and engage this influential generation of donors and activists – with fresh insights on how millennials get involved with and support social causes. For example, MIP reports that 84% of all millennial employees gave to charities in 2014; and, among givers, 22% gave through workplace programs while 78% did so on their own. The really cool thing is that 84% is a pretty high rate of giving for a population that’s merely in its 20s and 30s, and underscores the “do good” vibe of this generation. So, corporates, please sit up and take notice! In parallel, there’s also a change in business attitudes, with an increasing partnership between the business world and corporate philanthropy – with clear proof that doing good benefits a company and its bottom-line in more ways than one. And, as the most frequent participants in workplace philanthropy, millennial employees are helping guide this partnership while bringing about important changes in work culture through their charitable interests and engagement. The Millennial Impact Project focused on three key attributes: Give, Serve, and Inspire. Give focuses on attitudes and preferences for making charitable donations through formal workplace giving campaigns and donation drives. Serve deals with employee volunteerism, managerial attitudes and examples of company volunteer actions. Finally, Inspire explores the relationships that influence employees and managers to volunteer and donate through corporate philanthropy initiatives. Through an understanding of these three key vectors, employers can strengthen corporate philanthropy programs, cultivate a workplace culture that is attractive to millennial employees, and build a strong and loyal workforce. Millennials are also far more into each other, with a web of connections at home and across the world that they’re constantly in touch with through their mobile phones, ipads and laptops (probably in that order too). So, it isn’t surprising that the MIP Report found that peers and direct co-workers had the most influence on millennial employees’ participation in charitable causes. Next, supervisors and managers also influenced giving but millennials appear to be less influenced by upper management. 46% of surveyed millennial employees said they were more likely to donate to a cause if a co-worker asked them while 27% said they were more likely to donate if their supervisor did too. And, in classic disregard for authority figures, only 21% said they were more likely to donate if top-ranking executives asked them to. Corporations must learn how to leverage this peer influence to increase employee participation in cause work, and benefit from increased employee satisfaction. And while peer influence is clearly important, company programming as a whole can successfully develop a workplace culture of giving and volunteering, and that must also come from the top. 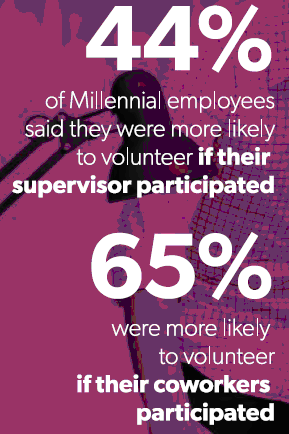 Millennial employees are a passionate hands-on bunch, and they’re more likely to volunteer where they can leverage their skills and expertise to make tangible contributions, as the MIP Report found – less talk, more impact! So companies should incorporate skills-based volunteering to increase employee participation and position the corporation to get the most out of the volunteering experience. And, don’t forget, participation in volunteering is governed by the same principle – peer involvement equals greater overall participation. Millennial employees also respond better to incentives and competition as motivators. So cultivating a sense of competition around giving campaigns or volunteer projects will increase involvement. So companies should offer tangible incentives such as name recognition, inter-group competitions and prizes to encourage millennial employees to participate. Today’s donors – and millennials in particular – want to know that their involvement makes a difference. In the MIP study, 79% of millennial employees who volunteered through a company-sponsored cause felt good that they’d made a positive contribution… so it’s important that organizations show employees how their donations or volunteer hours make a difference. Millennials are also significantly motivated to give more when corporations support their causes through matching donations. In fact, the MIP study found that 74% of those surveyed said they’d be more likely to donate to a company-giving campaign if their employer matched at least some portion of their gift. So Matching Gifts is an excellent way to boost year-round giving and help millennials feel aligned with their employer. Millennial employees put their money where their hearts lie, and give generously to causes they care about, and are less interested in causes they cannot directly connect with. While peer influence, competition and incentives may motivate millennials to volunteer or donate, this group of employees is most inspired to get actively involved when the company’s giving program evokes their passion for a cause. So, to run successful corporate philanthropy programs, it’s important that organizations focus on causes that millennial employees care about, and the best way to find out is by directly asking employees and building CSR programs around popular causes. Companies with institutionalized giving and corporate social responsibility programs see more participation in every cause-related initiative and higher employee engagement, happiness and retention… so companies should grab at this opportunity to engage employees through well-scoped corporate philanthropy programs to gain a real solid competitive edge.